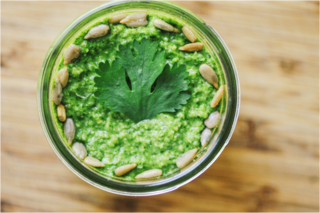 Super healthy, easy, delicious and vibrant green Cilantro Pesto perfect as a dip, topping, on pizza and pasta or any way you would use your favorite condiment! Not only is it magnificently tasty, it is amazingly versatile too. I've used it as a dip, a pizza sauce, and a topping for quinoa, and all were out of this world delicious! And, did you know that cilantro has many amazing superpower medicinal benefits? Not only does it contain a lot of antioxidants, it also lowers bad cholesterol levels & detoxifies heavy metals from the body! How can you go wrong there?! I will definitely be making this refreshing little creation a lot in the future, and if you choose to give it a go, I am certain you will too. . . Combine all ingredients in a food processor or blender & mix until smooth.Store in an airtight glass container in the fridge for up to 2 weeks. Enjoy!